As we have seen on these pages numerous times, the act of being a pedestrian is not an easy one, at least not on American streets. 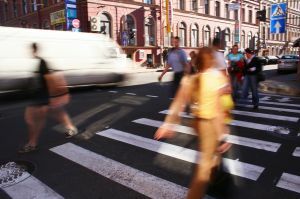 But as San Francisco pedestrian accident attorney Gregory J. Brod would point out, there are multiple perils that can prove dangerous for a pedestrian that go beyond our city streets and crosswalks. Indeed, as we saw on Wednesday morning in San Mateo in one of the more bizarre incidents, pedestrians can even run the risk of getting hurt when they are on the sidewalk. The incident in question occurred at about 10:30 a.m. when, according to the San Jose Mercury News, a group of five teachers and 15 students from Hillsdale High School were walking on the 300 block of West Hillsdale Boulevard in San Mateo on a school field trip and one student teacher and three special needs teenage boys, ages 15, 16 and 18, were struck by a car that inexplicably veered onto the sidewalk. The student teacher, a 28-year-old woman, suffered head trauma and broken bones. The three teenage students suffered minor injuries, including abrasions and lacerations. The four were about one block from their school when a car driving west on west Hillsdale by a 53-year-old man suddenly turned onto the sidewalk, striking the quartet. According to San Mateo police, the driver was driving through the neighborhood west on Hillsdale Boulevard when he failed to follow a curve on the roadway, ended up on the sidewalk, and hit the teacher and trio of students as well as a lightpole. Police said that the motorist followed an erratic course not to miss a roadway hazard, and the crash does not appear to have been an intentional act. The crash is still under investigation and police do not yet know what caused the motorist to take an errant course. Both the driver and the pedestrians were taken to area hospitals. The driver remained in police custody, but he has not yet been arrested on any specific charges. Police have also not indicated whether they believed that drugs or alcohol were a factor in the collision. There were 4,280 pedestrians who died in traffic crashes in 2010, a 4 percent increase from the total reported in 2009. In 2011, an estimated 69,000 pedestrians were injured on streets and sidewalks; 11,000 of those were children age 14 or younger, and males accounted for 65 percent of that total. In 2009, 16 percent of all traffic fatalities in the United States were suffered by people 65 or older. Pedestrians were one of the few groups of road users to experience an increase in fatalities in the United States in 2011, so clearly the dangers are great for people going outdoors on foot and much work remains to be done to improve pedestrian safety in our communities. Until then, if you or a loved one have been hit and injured or worse while walking as a pedestrian, please contact the Brod Law Firm for a free consolation.